I wasn't really sure if I was going to like this series or not. I really like the mortal Instrument books and I wasn't sure Cassandra Clare was going to be able to top her debut series. I was completely wrong. I was blown away. I loved this book. I thought Clockwork Angel was way better then the first Mortal Instruments trilogy. I love the Victoria Era of London that the book is set in. It was definitely a change of scenery compared to all of the books I have been reading lately. Jem and Will...goodness can you say book character crushes. I don't know which one I like better. They are both so appealing. I keep dating back and forth on which one I want to end up with Tessa and I don't even know if that is where Cassandra is going to lead the characters. I loved getting to know the new characters. I think I fell more in love with these characters than the TMI characters. Cassandra Clare did a wonderful job in describing Victoria Era London. I could picture everything she described. I felt pulled into the story at every page. 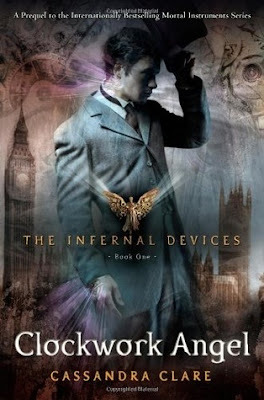 I think Cassandra did a wonderful job with this book and I am looking forward to reading the next Infernal Devices book. I am so glad that Magnus Bane is in the Infernal Devices series. He is my favorite character in the TMI series and to find out that he was in this series was A*M*A*Z*I*N*G. I want to see what happens with Magnus Bane and the ancestors of Alex, Isabella, and Jace. I loved that Tessa used her unique power (gift) to out smart her opponent. Cassandra definitely left me wanting more. 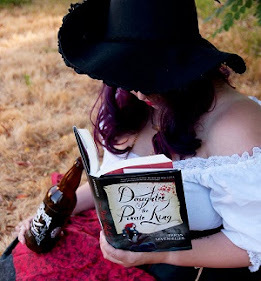 She wet my appetite...now I am dying to read more. I want to know about Tessa's past. Her parents? Cassandra left so many questions to be answered!!! This is definitely a must read book.